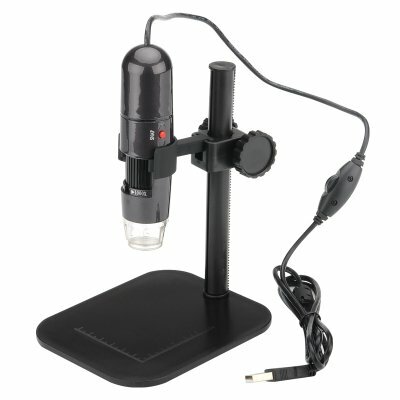 Successfully Added Digital USB Microscope - 1000 Zoom, 8 LED, Video + Photos, 1280x1024 Resolutions to your Shopping Cart. This Digital USB Microscope has a focal range from 0 to 40 mm and with a 1000 times zoom lets you get a close up of the world on a microscopic scale. This digital microscope uses a CMOS sensor and will capture sill images un high definition at 1280x1024 resolutions, you can also view real time events with at 30 frames per second and the built in 8 LED lights ensure that the subject of your microscopic investigations is perfectly lit. Ideal for the classroom, at home or in a laboratory this USB microscope is compact and light weight making much more portable than traditional counterparts. Whether you’re inspecting materials, teaching a biology class, working on fine detailed jewelry or with small integrated circuits this digital microscope will bring a high resolution image to your computer screen letting you examine minuscule details of any items. Compatible with most versions of Windows OS software and offering picture and video capture this USB microspore it a great visual aid for inquisitive minds and has hundreds of practical applications. This Digital USB Microscope comes with a 12 months warranty. Brought to you by the leader in electronic devices as well as wholesale digital microscopes and measuring tools..